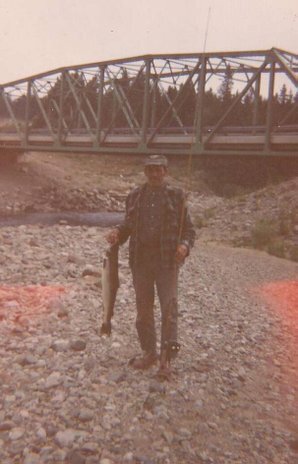 Father and I did not do a lot of salmon fishing together and I can not recall when he started fishing salmon in earnest. i dare say it was in the early 70's. After landing his first salmon all trout fishing fell into the background. His health was beginning to fail about then as well.. He decided a canoe was in order. So he gathered up a bunch of cedar, bought a second hand table saw and edger and proceeded over the winter to construct an 18 foot square stern canoe. Then purchased a small motor. and was off to the river. After one season he decided the canoe was not stable enouigh for his liking...That Winter he built another canoe..This time a 22 footer with a much wider beam...You could almost stand on the side of that one. 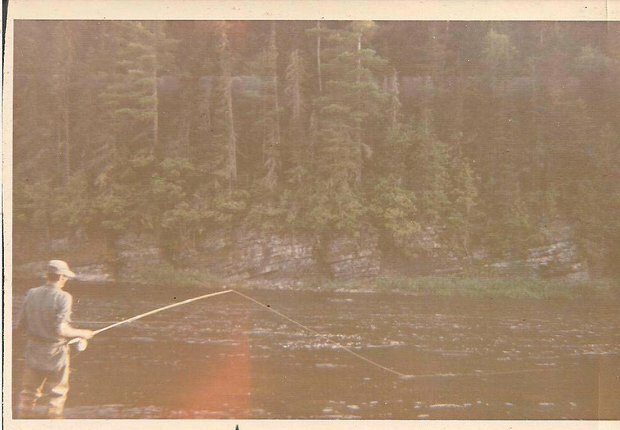 I think my first salmon fishing trip with Father was on the Tobique River. I politely let Father start down through the pool first and I stepped in behind him.. He was about one quarter of the way down the pool and rose a decent salmon. He turned to me and said "did you see that?" ..Unfortunately I was in the middle of a cast and had severeal coils of line in my hand..I could not help myself..I simply released the coils and sait "it was about there wasn't it? 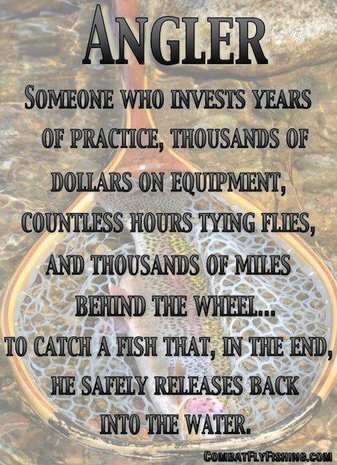 "..The fly no more than hit the water and the salmon was aboard.. It was a very rude manouver but he did not say a word..He simply waded to shore and sat down. After I played the fish a few minutes, Father waded back out with the dip net and offered to net it. He succeeded in netting the fish. Lifted the fish out of the water , said "nice fish" and then turned the dip net upside down and away went the salmon..But the hook still held. The salmon made a downriver run..Left the pool.and went nearly to the end of my backing. It took a while to lead the fish back into the pool..Again Father asked if I wanted him to net it. You can imagine what I told Father to do with his dip net. 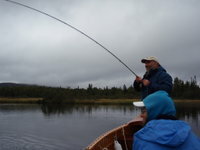 In New Brunswick it is necessary that you have your fishing license with you while fishing. I put my license on the cupboard so it would not be forgotten..And it promptly was.. I traveled for an hour to the Dunfarvan river to visit Father who was tented there..No one was fishing the pool at the time so I decided to try my luck. Shortly after starting to fish at the head of the pool I noticed a pick up drive in. A smallish lad got outr and went over to talk to Father..Father told him that I should be checked as I was a poacher.. Shortly thereafter he bustled up to me and requested to see my fishing license. At that point I could vision the license laying on the cupboard. As this lad was only a seasonal hired by the Dept of Natural Resources I immediately pulled out my badge and id and informed him I was a fishery officer working undercover.. The lad turned on his heel and went straight to Father saying that I was a fishery officer and Father was trying to get him fired. In between laughing bouts Father explained to him who I was. I was not amused, nor was the warden. years. 25 years of law enforcement was enough. Married for 35 years and yet to have an argument. Two daughters out on their own now. I enjoy painting, woodworking, fly-tying, computers and fish when I can. Most fishing I do now is on the Miramichi River system. Funny story Stephen. Keep them coming.